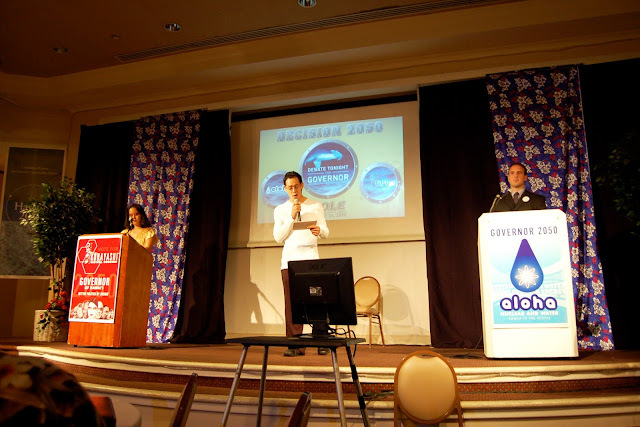 It is exactly ten years and one day since an event that turns out to have been something of a milestone in the foresight work documented at this blog. "Hawaii 2050" was an initiative of the state legislature to engage the public in addressing the islands' sustainability, over a commendably farsighted time horizon, nearly two generations out. At the time the project began, in late 02005, more than three decades had passed since the last comparable process. A big-picture re-examination of Hawaiian prospects was overdue. 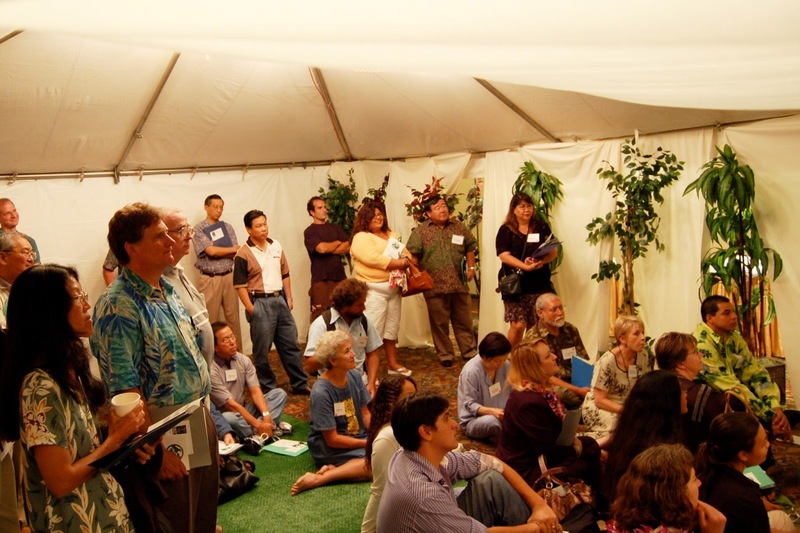 At that time I was a graduate student in University of Hawaii's "Manoa School" of futures studies, founded and run by Professor Jim Dator, who had taught the first futures course in the United States in 01967, at Virginia Tech, and then became closely involved in "Hawaii 2000" in 01970-71. 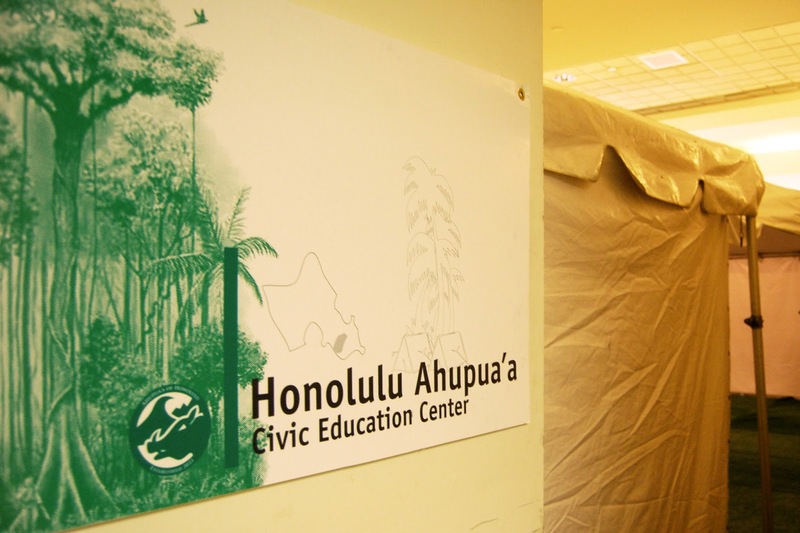 He was also founding director of the Hawaii Research Center for Futures Studies (HRCFS), an agency the state had established at the end of that process, and which it then engaged more than thirty years later for a 02050-oriented effort. 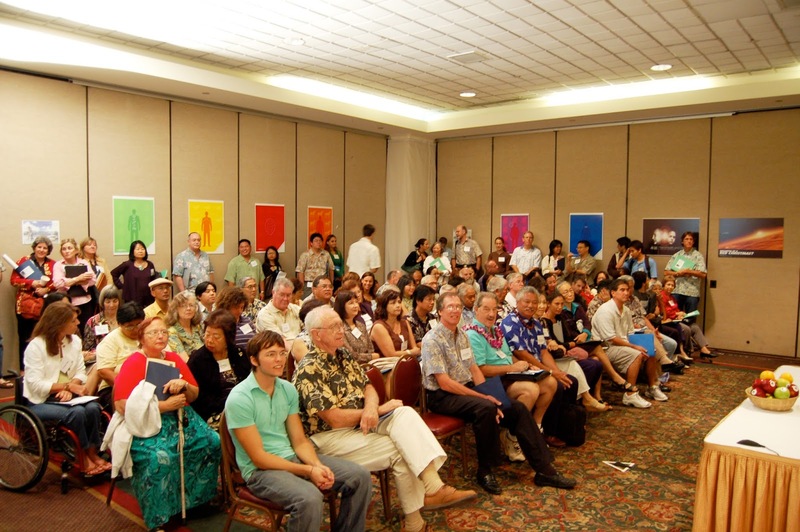 To help bring the fullest possible consideration of alternative futures to the "2050" Kickoff on Saturday 26 August 02006, staged at the charmingly shabby ballrooms in the former Dole pineapple cannery, my HRCFS colleague Jake Dunagan and I put 550 or so people into four rooms. We had designed and staged these rooms, with the priceless involvement of two improv theatre troupes, as well as a gaggle of wonderful colleagues and friends orbiting the Futures Center, to embody alternative possible Hawaiis set in the year 02050; a quartet of radically different social, economic, and governance outcomes. In one (code-named "Orange"), the islands had found a way to continue a growth trajectory, dramatised via an election in which candidates were not individuals but corporations. 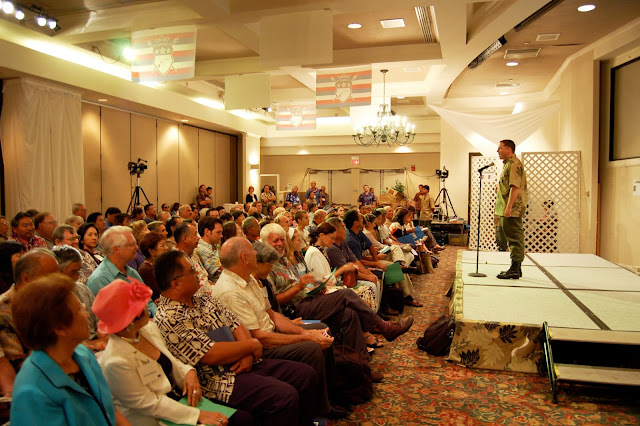 In the second ("Silver"), global economic meltdown had led to a tentative, militarised reassertion of the islands' independence from a presumably beleaguered U.S., the so-called "Democratic Kingdom of Hawaii". 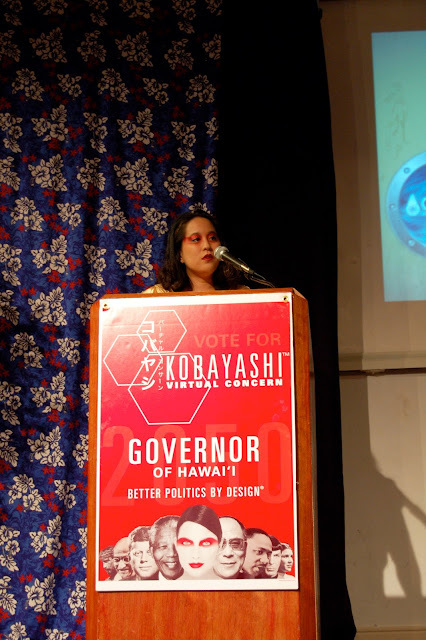 In future number three ("Maroon"), a concerted effort had been made to realign political and environmental priorities, though the adoption of Hawaii's pre-colonial, watershed-based ahupua'a governance structure, combined with "bright green" environmentally friendly technology. 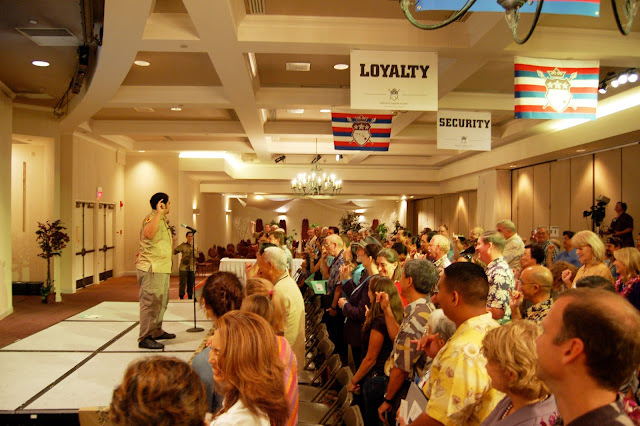 The fourth experience ("Blue") was of a future where not only society but the very definition of humanity had transformed, with the World Council seeking to bring the Pacific Islands' underprivileged premods––regular, unaugmented people––up to par. Our intention was to give people a chance not just to contemplate these potential realities as intellectual hypotheticals, but to visit physically and invest emotionally in them. Thus this set of brief yet provocative immersions, instantiating highly contrasting assumptions and theories of change, as a fast-track to higher quality, more richly imaginative mental models and civic conversations. The original notion for this experiential approach to the Kickoff, which I'd proposed in hopes of avoiding the uninspiring albeit reliable standby workshop formats, was to expose people to the scenarios via a series of tangible artifacts physically set out on parallel (or rather, diverging) timelines. Following that approach would have meant creating a sort of popup museum of alternative future histories, or a real-life gallery counterpart to Wired magazine's back-page feature Found: Artifacts from the Future, as I thought of it at the time (this was before design fiction). But we soon realised that the interest of maximising narrative engagement and comprehension, as well as the sheer practicalities of moving hundreds of bodies through multiple rooms on a tight schedule, militated for scenarios unfolding over time, as performances, with built-in roleplaying opportunities for attendees. 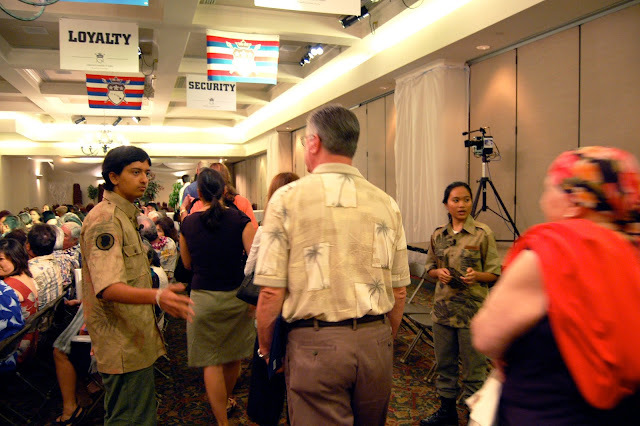 The "Hawaii 2050" scenario rooms were therefore immersive and experiential not only literally, with participants surrounded by performers and designed media (set dressing, props, soundscapes, etc), but also narratively, with each room devised as a coherent scene that would place attendees in medias res, and invite in them a sense of being transported in time. 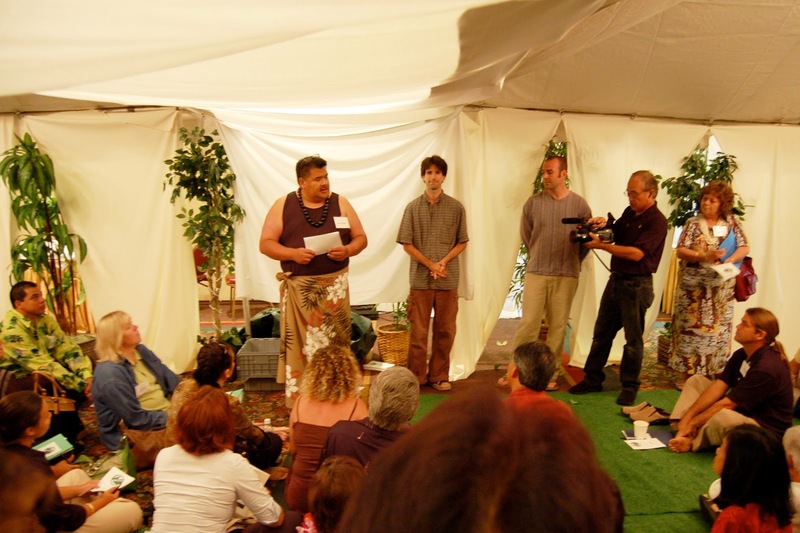 We aimed to ensure that people would not only witness these futures first hand, but interact with and within them: hence, four situations from alternative futures: a pre-election speech night; a naturalisation ceremony for climate change refugees; a government-mandated sustainability class; and an information session at a posthuman wellbeing facility. None were supposed to feel like tendentious "best" or "worst" outcomes. Instead we wanted to offer qualitatively differentiated stories, in the classic Manoa School mould. To mirror some of the complexity of real history, we hoped people would find both good and bad things in each world they visited; genuinely "alternative futures" as opposed to mildly different flavours of the same idea, as scenario generation processes sometimes yield. Building on this divergent futuring tradition, we reasoned that more vivid and sensorily engaging food for thought could help support wiser decision making in the aggregate. Following a year of meetings with state legislators and public administration collaborators; after weeks of intensive work and long days that summer, of Jake and I making thousands of directorial decisions large and small, of generating dozens of artifact concepts and iterating their execution with our astoundingly resilient graphic design helpers, of writing and rewriting scripts and workshopping them with actors, of eking out our shoestring budget to make every room as fully realised and detailed as possible, of criss-crossing the island doing everything from taking venue measurements to sourcing fabrics for future military outfits: somehow, impossibly, the futures arrived at last. 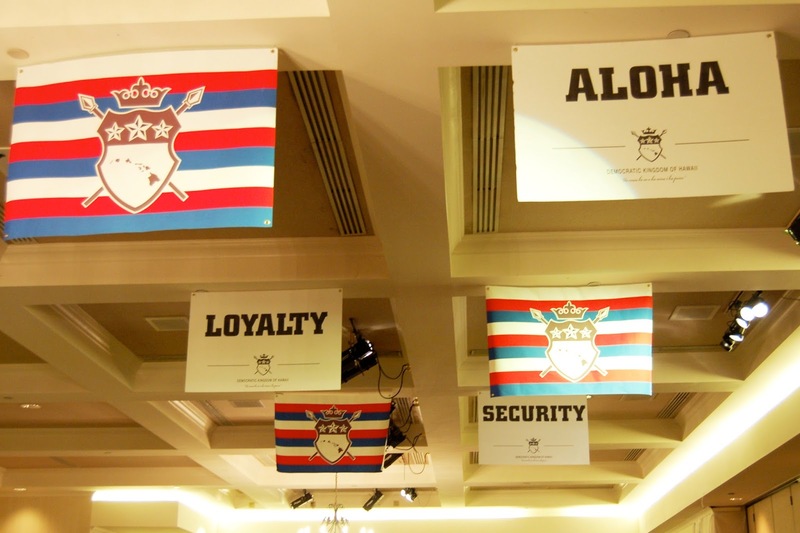 And on that Saturday morning ten years ago, as the time for the first round of experiences approached, taking place in four rooms simultaneously, I have a memory of walking through the ballroom lobby in a daze, emotionally addled, exhilarated, exhausted, halfway between tears and laughter. For us this was the mother of all proofs of concept. It was of course bound to be a big deal, in our minds, if for no other reason than the amount of work involved, and the responsibility of delivering all we had promised––without a clear precedent that we knew of––to state senators and other community leaders, not to mention our colleagues and collaborators. The fruits of our collective labour soon began to emerge. 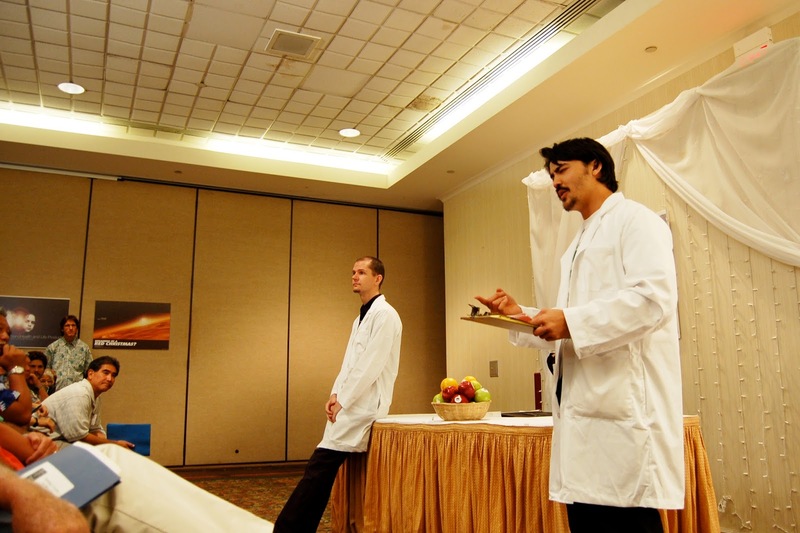 One participant was so disturbed by the cynical appropriation of Hawaiian culture depicted in the post-collapse room that he started breaking the scene to argue about it. We could not have been more delighted: real feelings about our hypothetical narrative! The four experiences elicited various responses from laughter to discomfort, bemusement, and also genuine passion. The post-immersion dialogue in all rooms was unusually energetic. The exchange of values, hopes, concerns, ideas, and intentions was meaningful and earnest. 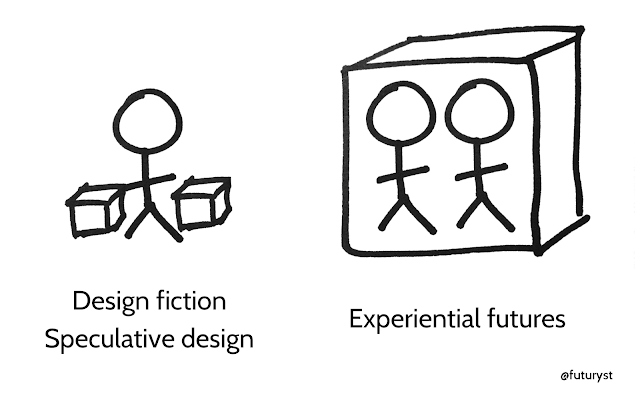 The verdict was in: our first trial of what we soon came to call experiential futures had worked. The project didn't immediately generate a lot of media attention, and this was all a couple of years before social media took off –– although our guest Jamais Cascio from Institute for the Future did a great write-up. And, in years afterward, the event has cropped up here and there in design literature, for instance in Parsons/ex-RCA professors Tony Dunne and Fiona Raby's Speculative Everything, and more recently in Umeå University prof Håkan Gulliksson's Pervasive Design For Sustainability. But what about the impact on the islands themselves? In case it had not been clear from reactions plainly visible on the day, some 94% of respondents to a Kickoff exit survey indicated that the experiences had impacted their thinking and desire to take action accordingly (see The Futures of Everyday Life p. 105 for details). But for reasons reaching well past the scope of our modest involvement –– Hawaii 2050 was a big undertaking, not confined to the futures-oriented kickoff events described here –– both the immediate political outcomes of the Kickoff and the "Sustainability Plan" published in 02008 were, in my view, underwhelming (see earlier account in TFOEL pp. 8-13). I moved away a few years later, and others are better placed to gauge how the influences of "2050" and our part in it, if any, have played out since. 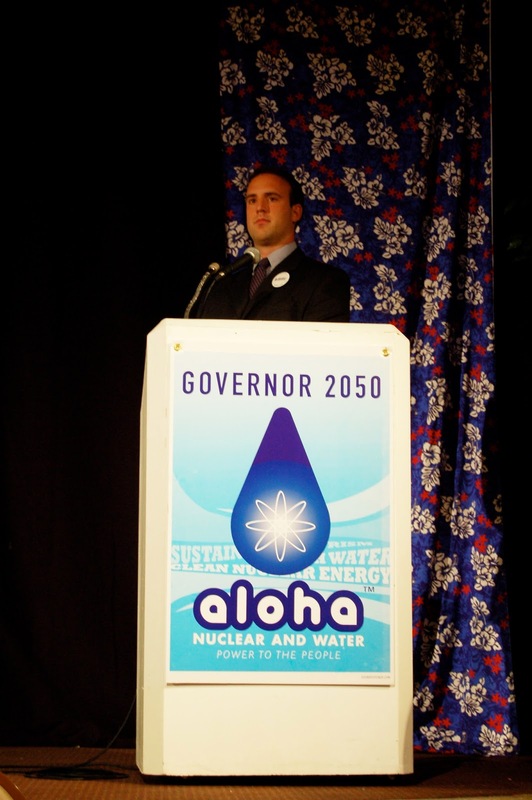 Although I did take heart from the news, reported one year ago, nine years to the day after the event, that Hawaii's governor was committing to dump fossil fuels for 100% renewables by 02045. In any case the significance of this project –– or rather, the story I am trying to tell here –– is personal. Looking back after a decade, "Hawaii 2050" was a point of departure, breaking our futures work open to a much wider world of collaborations, creative possibilities, media and settings. Jake and I had always meant for it to enjoy an active afterlife; many of the individual artifacts we had designed were soon repurposed for the first guerrilla futures interventions in our (ongoing, periodically) transmedia public art collaboration FoundFutures. 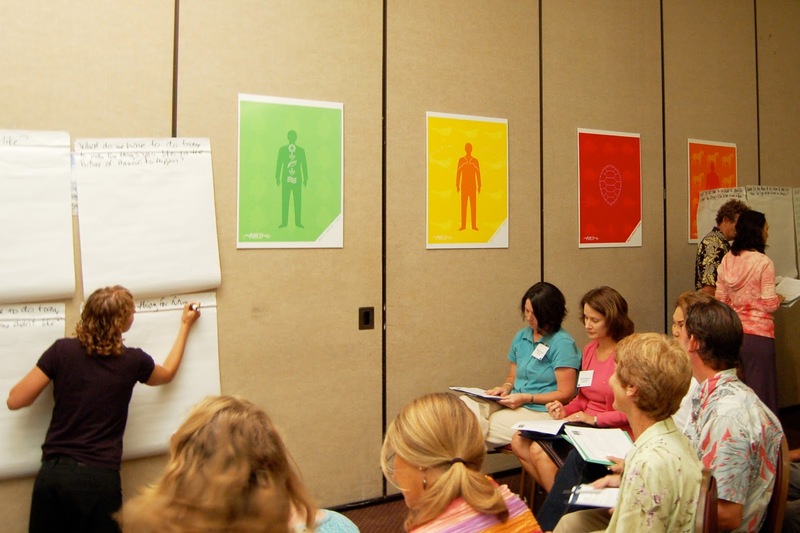 We went on to explore and map experiential futures practice as fully as we could, systematically experimenting in as many contexts and media as possible: in the streets of Honolulu's Chinatown and at the University of Oxford, at South by Southwest, and California Academy of Sciences. We did projects in magazines, mailouts, games both online and offline, and short videos; projects for festivals, galleries, universities, national governments and the United Nations; commercial clients and random members of the public. On the academic front, I wrote my dissertation on the topic, and we've also developed Experiential Futures methods in classrooms all over the place, which is a story for another time, although there's a glimpse of it in this recent piece for The Economist's World in 2016. 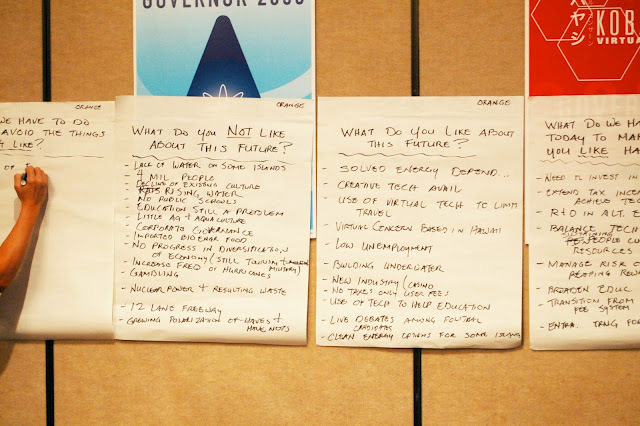 Today I find myself regularly thinking of, and occasionally borrowing from, ideas tucked into the details of the scenarios, or elements from among the dozens of costumes, badges, posters and other items produced for "2050". Situation Lab's first Futurematic design jam with The Extrapolation Factory, which filled a vending machine with future artifacts made in one day in 02014, was a benign conceptual cannibalisation of the vending machine full of future artifacts which had sat largely unnoticed in the corner of the Blue room ("InstaSleep" pills - eight hours in eight minutes; "Inhale" - health enhancing cigarettes featuring anti-cancer nanoclouds; "Ahoy" - enhanced chocolate bars for replenishing essential vitamins lost during space travel). Having spent my undergraduate years training in mostly hyper-intellectual and unimaginative ways of thought, in class at least, I never really had a way to relate to art as something I could do. I spent a year trying (and failing) to make a documentary on my own dime, in the former Yugoslavia, and then another half year starting a business (also failing) in Canada. But it was in that first year in Hawaii, collaborating with my dear friend Jake Dunagan, that this project helped to unlock a door that has only continued to open wider. I still have a box full of these future artifacts, and packing them up to move house last week stirred a lot of recollections. See, when you make stories, images, artifacts, interactions and experiences from the future for a living, they are constantly circling back to play with you. In this work, we are not just creating experiences, or even memories. Experiential futures is about the design of ghosts of a special sort –– not the remainders of things dead, but the advance traces of things waiting to be born. Ghosts of what is yet to come. Ghosts of the possible. I have come to suspect this is one of the primary purposes of art. We create it to haunt ourselves. When it stays with us, that is how we know it is working. Here are the original scenarios for 02050 written by Dator, Dunagan and me, on which the four futures rooms were based. For a fuller look at the development of experiential futures practice, see this peer-reviewed article that Dunagan and I recently published about our project The People Who Vanished. All the photos in this post were taken by Cyrus Camp; most have not been seen until now. 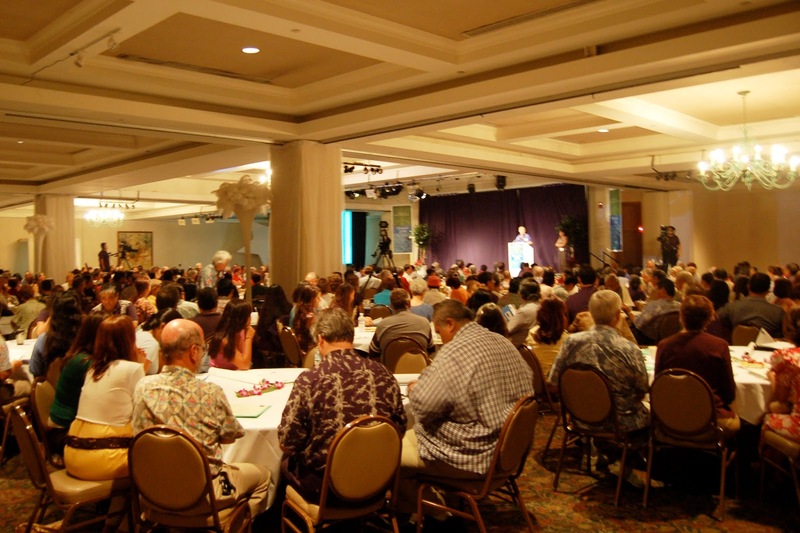 Finally, I want to register my appreciation again to everyone involved in bringing futures to life at "Hawaii 2050". Ten years later your contributions continue to haunt me, for which I am most grateful. Fantastic post - thanks for sharing it Stuart. For futures work to be of any real use, it has to create emotional resonance as well as intellectual stretch! Thanks, folks. Glad to hear this is of interest.